Defending champions Australia beat Canada by seven wickets in their penultimate Group A World Cup at M Chinnaswamy stadium in Bangalore on Wednesday. After dismissing Canada for 211 in 45.4 overs, they hit up the required runs, finishing with 212 for 3 in 35.5 overs. Brad Haddin 88 and Shane Watson 94 led the champions' onslaught after fine knocks from Hiral Patel (54) and Ashish Bagai (39) enabled Canada put up a fighting total. Brett Lee was Australia's best bowler, finishing with four wickets for 46 runs. Canada's veteran batsman John Davison failed to make an impact with the bat in his last outing in international cricket. The right-hander scored 14 before he was caught behind off Brett Lee. Davison, who hit the fastest World Cup century in the 2003 tournament -- the record was broken by Matthew Hayden four years later -- will retire after this match. The 40-year-old was born in Canada but has lived nearly all his life in Australia. Canada could not capitalise on opener Hiral Patel's whirlwind half-century as the Australian pace bowlers restricted them to 211 all out. They rode on 19-year-old Patel's 45-ball 54 to reach a comfortable 150-2, before the Australian fast bowlers returned to wreak havoc and dismiss the last eight North Americans wickets for 61 runs. The teenager was the aggressor-in-chief as he slammed Brett Lee, Shaun Tait and Mitchell Johnson for a six apiece, besides five boundaries. 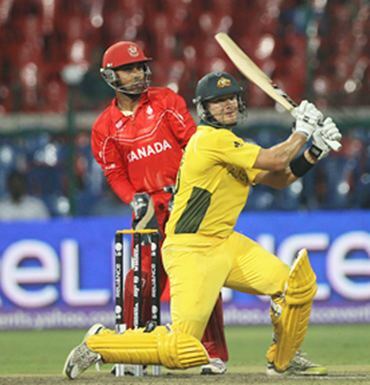 Canada blazed to 77 in 10 overs, and Patel eventually fell trying to whack the fourth of the Australian pace quartet, Shane Watson, for a six. 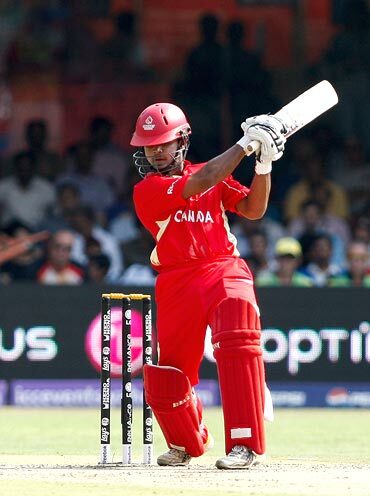 After Patel's exit, Canada's run rate slowed dramatically as their captain Ashish Bagai (39) and Zubin Surkari (34) rebuilt the innings and took the score to the 150 mark in the 29th over. - Team India not quite there yet! Tait returned to the attack and got Bagai to nick a wide delivery to the keeper. 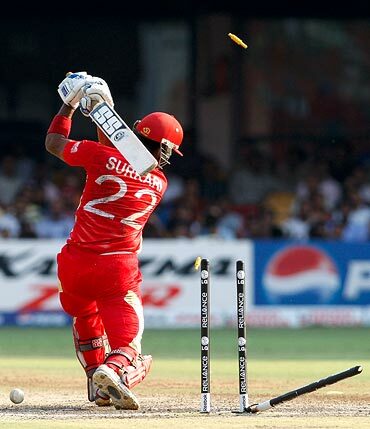 In his next over, he first softened up Surkari with a yorker, then with a full delivery to hit him on the thigh, before an inside edge crashed into the stumps. The North Americans then crumbled from a comfortable 150-2 to 161-6 in the space of 19 deliveries. Lee finished with four for 46, Tait picked up two for 34 while Johnson chipped in with one. Canada should have struck early, but Watson was given a life. Rizwan Cheema dropped a skier at mid-on off Harvir Baidwan in only the second over of the innings. Later, Nitish Kumar, running in from long-on towards deep midwicket, spilled one off leg-spinner Balaji Rao. Again, the benificiery was Watson. 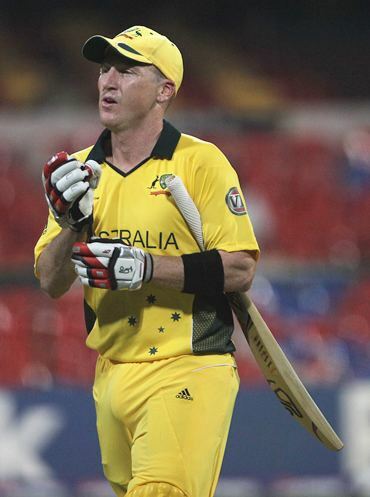 Haddin rode his luck and matched Watson shot-for-shot in his 84-ball innings of 88 until his luck finally ran out in the 29th over when he was caught behind off the bowling of John Davison, who retired from international cricket after this match. Four balls later man of the match Watson was caught on the boundary off the bowling of Harvir Baidwan trying to reach his century with another six. Michael Clarke and Cameron White then completed formalities. Ponting's dismissal to Osinde with Australia just five short of the target was only for statistical purpose. The victory took Australia's unbeaten run in the World Cup to 34 matches, stretching back to 1999. They go top of Group A.